The 432 Chamber Orchestra is Bulgaria’s newest chamber string orchestra. It has 13 players and 1 conductor. It was founded in November 2013 in Sofia as an experimental ensemble from the conductor Ivan K. Yanakiev. The Orchestra made its Debut on stage in Sofia in 2015. Since now it has given 3 concert performances. The 432 Chamber Orchestra is laureate to the Bulgarian National Radio’s award “Musician of the Year” – 2015 in “Debut”category. (the ambiеnce). In 2014, the prominent Bulgarian composer and conductor Academician Prof. Vassil Kazandzhiev after hearing the 432 Chamber Orchestra for the first time expressed his astonishment that even though the Orchestra consisted only of 13 players, it sounded as if a big string orchestra was playing. The mission of the 432 Chamber Orchestra is to guarantee the listener’s right to choose to experience music in the natural 432 concert pitch. The Orchestra exists as an option to the standardized (by ISO 16:1975 a1 = 440 Hz) sound of the professional ensembles. We can hear the 432 concert pitch, the most prominent trait of the Orchestra, and its natural existence: in the songs of the birds; in the folklore music (worldwide) – by both singers and players; in the spiritual music – during Orthodox offices; and most importantly, in the melodious speech of the young children and toddlers. Yanakiev’s hypothesis is that 432 concert pitch may be considered a phenomenon, which is natural to the human being as a part of Nature. His observations also show that the choice of temperament and the concert pitch can affect the attitude of the players and the listeners towards the process of music making. In a1 = 432 Hz and “open fifths” temperament the essence of the music (i.e. the idea beyond the notes) can be clearly heard and felt by the listeners, while at the same time the personality of the player seems to melt and vanish away. Just the opposite happens in a1 = 440 Hz (ISO 16:1975) – the personality of the player now overwhelms the entire music expression and the listeners receive not the pure musical essence of the piece, but the subjective, emotionally tainted experience of the player instead. In this regard, Yanakiev is preparing series of psychological and psychophysiological experiments in the Institute of Art Studies of the Bulgarian Academy of Sciences, Sofia. We are inviting everybody who might have interest to participate in a music comparison survey by clicking on the following link: Music Comparison Survey. Each reply is of great importance. 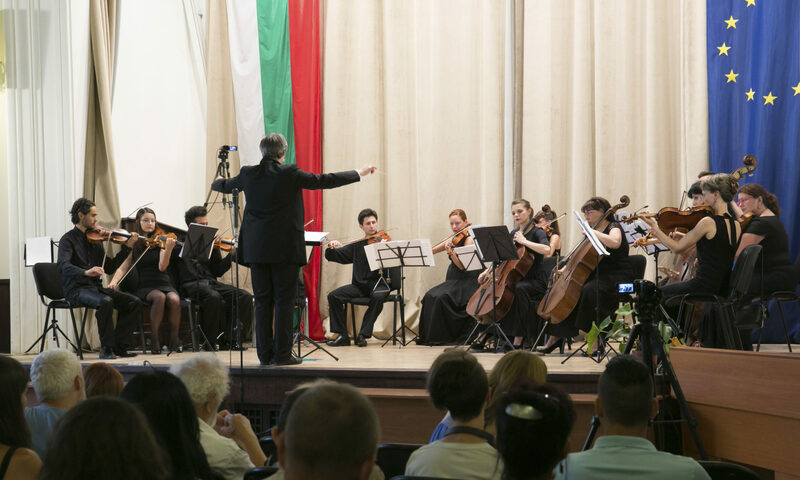 In 2015 – the 432 Chamber Orchestra made its debut on the Bulgarian concert stage. It gave two concerts – 18th May in “Studio 1” of the Bulgarian National Radio and on 22th December in “Dr. Long” Church, Sofia. Until now soloists of the ensemble were the prima soprano Veliko Tarnovo’s Music Theater Miryana Kalushkova (more about her: https://www.operamusica.com/artist/miryanakalushkova/#) and the tenor Ivaylo Donkov (Sofia Philharmonics), who has specialized Baroque singing with PhD Yanko Marinov (Catholic Cathedral, Sofia) and Emma Kirkby (Italy, 2015).